Bill Covitz is the owner of Ice Matters™, an ice carving company he opened in 1999 - however, ice was not his first calling. Bill is a former Chef and a 1991 graduate from the Culinary Institute of America in Hyde Park, New York. As a Chef, Bill spent several years working in fine dining restaurants throughout the United States, specializing in French Cuisine and also worked as a Private Chef in both France and Belgium. Fulfilled with his career as a Chef, he went looking for a new avenue to explore his artistic calling - leaving the hot kitchen for the cold freezer. 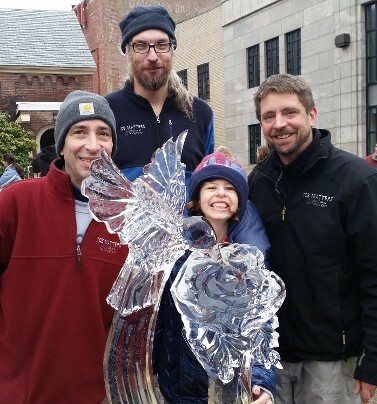 Raised in Ridgefield, CT, he decided to move back to his home state and open an ice carving business. 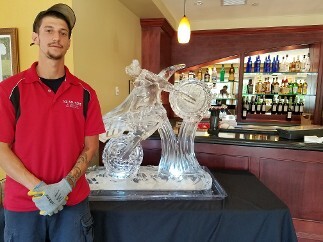 He now works in a 12 degree studio creating ice masterpieces for country clubs, hotels, banquet facilities, restaurants and individuals throughout Connecticut. At the 2004 National Ice Carving Association's Nationals he was the Grand Champion, placing first on both days of the 2-day competition. This honor was the icing on the cake for Bill as he was undefeated in local competitions for several seasons. 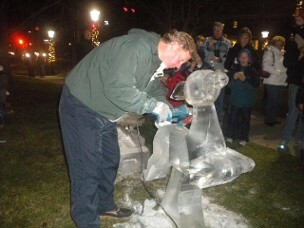 In March of 2006 he placed second in the world at the World Ice Art Championships in Fairbanks, Alaska. In February 2009, after taking several years off from competing, he returned to the National Ice Carving Association's Nationals and placed 2nd with his Praying Mantis design....his favorite yet! Creating ice instruments on a mountain top in Norway, something he has been doing every year since January 2006, has been an exciting challenge and he hopes to continue making ice music possible in the years to come. 2013 proved to be a busy ice music travel season with a four city tour in February 2013 and a trip to Greenland with a Canadian production company in search of the perfect ice in August. At each location he made instruments for Norwegian musician, Terje Isungset to play. 2014 marked Norway's 200th year of independence and was a much celebrated event. Bill replicated buildings in ice for the Norweigan government as well as created the stage and ice instruments for the celebration. 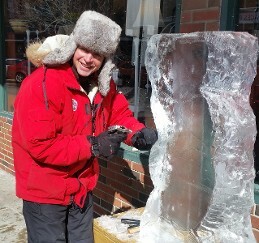 In 2015 after creating cool snow sculptures in Lilehammer, Bill created ice instruments in Geilo for the 10th annual ice music festival. 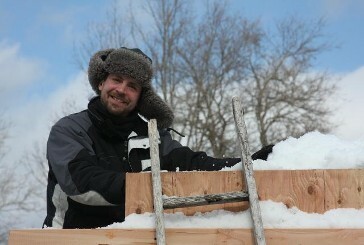 In 2019 he retunred to Norway to create snow sculptures for a top-secret storybook project. ...shhhh. On a personal note, he loves golf, archery, power tools, power toys, wood-working and is the proud father of two boys and husband to the office girl, Jen. Finding people who work well together is worth the work. We are all working together, creating a full circle. We're using what nature provides, sculpting its frozen form into something unexpected, then returning it to nature...while making the process in which that all happens our business, our family, our living. Thank you for supporting the art of life! 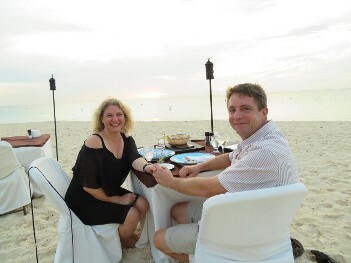 Recently married, Dylan hails from California but has been living in CT for several years. Way back when, Dylan was our first employee...several years later we reunited and he has been with us ever since. He is a carving machine and we are so thankful and proud to have him in our Ice Matters™ family. Dylan enjoys spending time with his new bride, playing the guitar and being on the water: kayaking during the warm months, skating during the cold months. He is shown here skating with his wife and has our youngest son in a head lock. Can you feel the love?! Master of set ups and fixing anything with zip ties, Mike is cool headed and keeps things running here at Ice Matters...and has started working on his carving skills, too! He keeps us laughing and is always willing to show our boys the ropes around the shop and has fun doing it. We are so excited that he is part of the Ice Matters™ family! Speaking of family....he is a proud new papa to a bouncing baby boy. He loves spending what's left of his free time riding dirt bikes and having adventures! 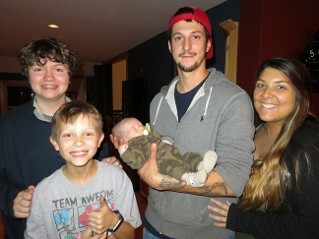 Shown below with his beautiful family and our boys when they met his adorable baby for the first time. Also pictured is a great example of his sense of humor hiding in plain sight on the carving table...oh, how he makes us laugh! The newest member of our Ice Matters™ family is an ethusiastic young Eagle Scout. He helps with block production and wrapping the beautiful sculptures when they are done...and he does it with great pride and a big smile! He always surprises us with his witty comebacks and sense of humor. But the biggest surprise was saved for Bill when he presented him with the Mentor Award at his Eagle Ceremony, a humbling moment for Bill. In addition to continuing to help with scouts, David is a college student and an aspiring comedian. Working here has provided him with not only work and life skills, but perhaps more importantly, quality material for his stand up rountines. Luckily we all have a sense of humor, too! 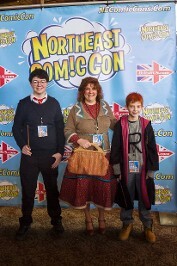 Our son, Liam is pictured here dressed in the Groot costume he made for Halloween. In addition to creating amazing costumes, Liam also enjoys customizing lego's, sketching, camping, target shooting and playing D&D. He keeps busy with school, sings in the chorus, babysits and is a Boy Scout. One of these days he will start training in the office. Below he is pictured , age 11, with his first ice carving, Uni-Kitty and more recently helping Mike out with a pick up during a snow storm...how time flies! Our son Joshua is eager to learn the ropes...so Mike showed him how to pull blocks. He is pictured below with the first time he got to use a chisel, age 6. In addition to helping with anything and everything, Joshua is also a creator of custom costumes - check out his cool Reeper from Overwatch he made for ComiConn. He also loves to paint, trace, play D&D, target shoot and camp. He stays busy with school, scouts and learning percussion instruments. 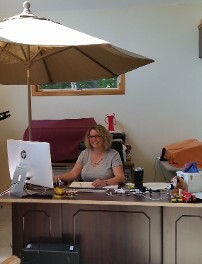 And here I am, the office gal/owners wife/mom, Jen, pictured in my office, taking time off with my amazing husband on our 20th wedding anniversary and a fun weekend with the kids at a com event. Working from home can be noisy, but this is a family business and I do my best to take calls when the house is quiet...it is never a guarantee, but few things in life are :) I love my job and speaking with your amazing customers. My hours vary, based on the other hats I might be wearing at the time, back to the wife/mom part, but I do my best. I take one call at a time; the voicemail will pick up if I am on the other line. If you leave a message I will always call back. When I am not busy at work I enjoy completely unplugging, reading, crafting, camping (in nice weather), mini golfing, playing Catan, and organizing. Well, what can I say, he is too cute not to include and he is not only part of the family but part of the Ice Matters™ team. 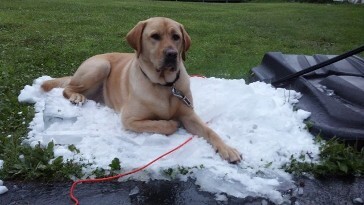 Shown here patiently waiting in a pile of summer snow to alert us that a pick up has arrived. What a good boy! Gary has been a part time member of the Ice Matters™ team for years. Lucky us! His full time job is as a Chef Instructor here in CT. 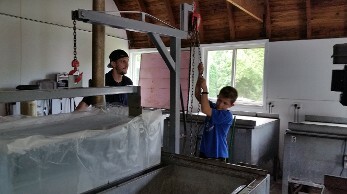 He works for us whenever we need help, doing demonstrations, delivering ice and at the shop programing the machine. He is married, with two children, hard working and forever a great guy to have around. We are lucky to have him share his talents and friendship with us! We are so grateful after working with Matt for so many years that he is still working for us when he can. Matt is the proud father to an adorable little girl and happily married to his awesome wife, Jean. The cool giraffe sculpture he made at Lyman Orchards in 2014 is in the background. Erik, aka "Uncle E" grew up with Bill in Ridgefield, is an all around great guy and our best friend. He is always there when we need him and always has a clear head when it comes to business. When he isn't helping us with competitions (Bill went undefeated with Erik by his side for YEARS), demonstrations, deliveries....or watching our "horse" while we are away, he works as the Executive Chef at New Haven Country Club. Lucky members!!! 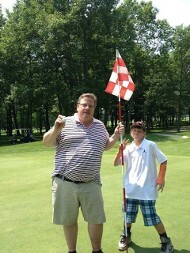 He enjoys fishing and target shooting, but most of all he loves to golf - pictured here after getting a hole-in-one on a par 4 in June 2013 on the 8th hole at Fariview Farm! He also loves our kids and taco night! And we love him! Tom is now a seasoned member of the Ice Matters™ family, and is still living up to his 3 nicknames! He answers to "Master of the Angle Grinder", "King of the Freezer Drops" and "Fill in Dad". 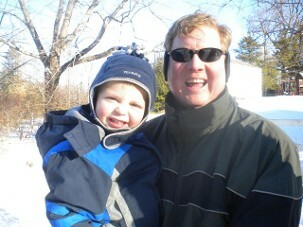 (He is pictured here, some time ago, with our youngest son.) Or you can just call him Tom, he answers to that too! Tom is a husband, father and owner of The Heritage Group, www.heritagegroupct.com. He is always there when we need an angle grinded or a sculpture freezer dropped! He balances a happy family and business like no one else!